While sorting the affairs of his late Uncle, a man accidentally stumbles across a series of dark secrets connected to an ancient horror waiting to be freed. Dan Upton is concerned about the influence of a young woman upon his friend Edward Derby. While a series of dismemberment killings in Arkham seems to be linked to a Cthulhu cult in nearby Innsmouth and Dunwich. Q: How close is this film to the Lovecraft story? It seems that too many people have little or no appreciation for the art of film making and its history. Being a huge Lovecraft fan and been very disappointed in just about every film adaptation of his works I skeptically found this gem a refreshing change. What could have been its down fall make sit work. Of course those jaded folks who need their horror served up with heaps of blood, guts and slick CGI effects are in for a disappointment. The effects are what they are but even a stop motion of Mighty Cthulhu and classic film tricks don't take away from the challenge, a film adaptation of Lovecraft that is true, this is it. It should appeal to those of high intellect who read the works of Lovecraft in spite of the many short comings in literary style ( I love the themes but how many times can a man us "cyclopean" or "unspeakable, unnamable" "eldritch" "ichor" laden horrors and in every tale?) Better writers then me have noted that his style is ponderous yet his influence and contributions to his genre cannot be missed. 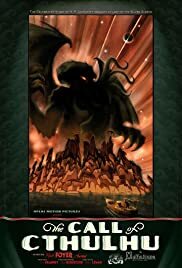 Mighty Cthulhu rises from his cold deathless sleep and moves to steal mankind's soul and sanity in a film adaptation that will give a fan of the master a true tale and a good initiation to the novice of the shapes horrors that creep in unnatural geometric chasms between the depths of distant stars gnawing away at the worlds end!! 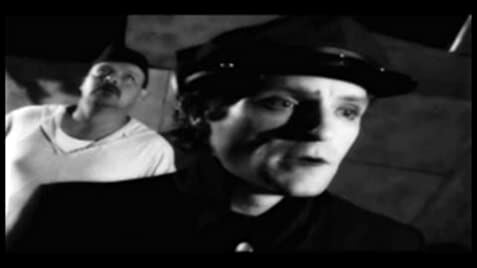 So a silent film made to seem as if it was made in the time of the tale, a vehicle to keep cost down and yet disguise what could be cheesy effects into a subtle nod to the greats such as mighty Kong in all his claymation glory and Harryhausen with all his twisted vision: Cthulhu Lives in this great little treat! !